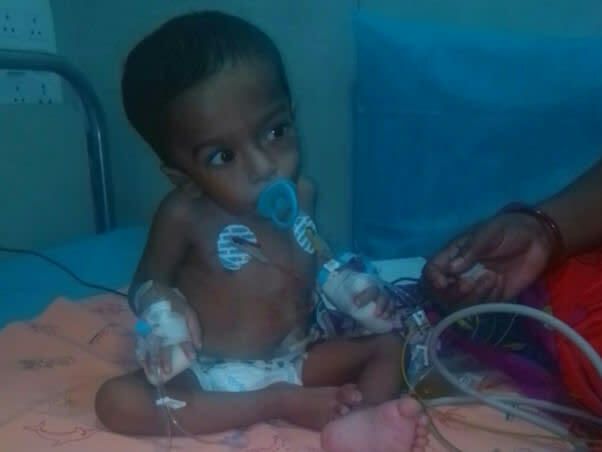 1-year-old Gnanasoundharyan has experienced only surgeries and pain in his life. His little body is going through immense pain due to Portal Hypertension, a condition where there is an increase in blood pressure due to which the veins rupture and bleed profusely. His parents are struggling to save their only son. Baby Gnanasoundharyan is the only child of Suganya and Prakash. They were thrilled with the arrival of their baby. Her pregnancy journey was smooth until her 8th-month scan revealed that the baby has portal hypertension. They were hopeful that they could treat him and take back home. 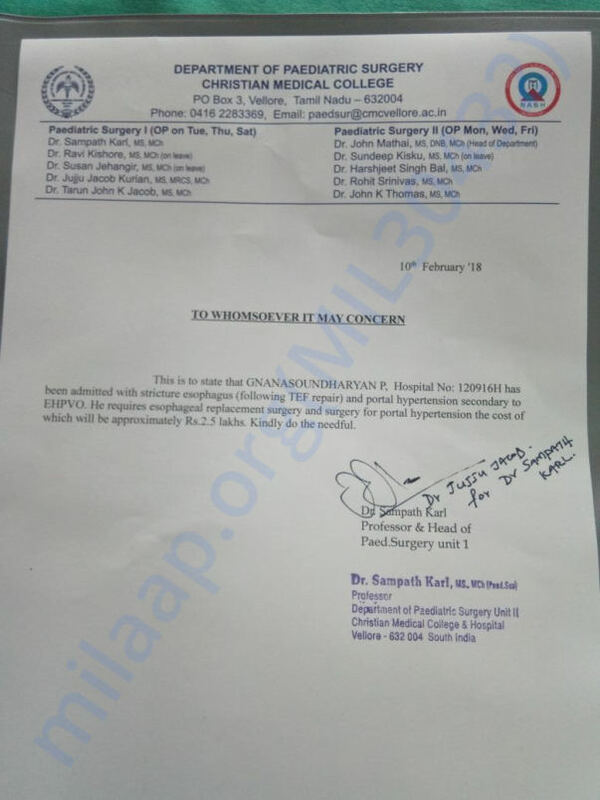 They were shocked that his condition turned very critical and may turn fatal if not treated. 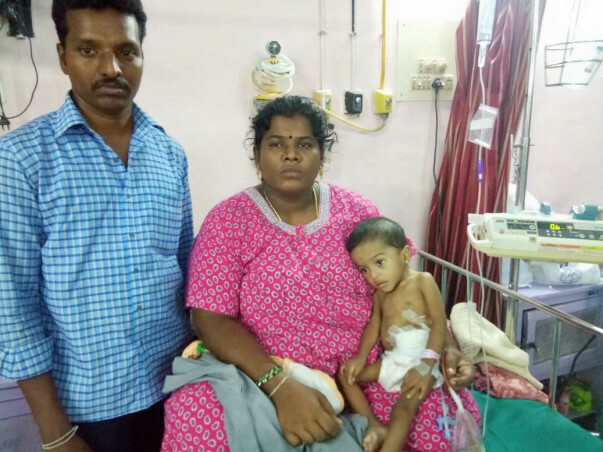 Baby Gnana had his first surgery when he was just 3 days old because his windpipe and food pipe were interconnected. He was fed through tubes. After 3 months when the tubes were removed, Suganya took him to home. He seemed to be normal and Sukanya believed her nightmares are over. She was terrified when her son started bleeding from his mouth.She rushed him to the hospital. Since then his condition has only been deteriorating. "Every time he bleeds and cries out in pain, I feel like my body is ripped apart. He has only experienced pain ever since his birth. I'm dying to see him live a normal life. I can't lose him. He is my world." - Sukanya. 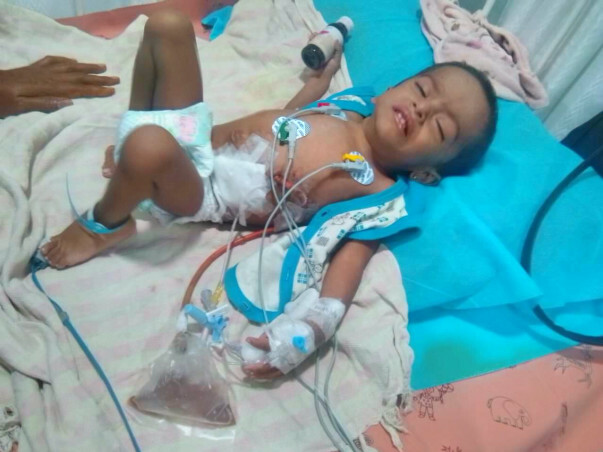 Baby Gnana's food pipe was blocked due to which he was bleeding and unable to eat anything. He had his second surgery when he was just 7 months old. Unfortunately, he did not respond well to the surgery. He struggled to breathe, his skin color changed and his stools were full of blood. 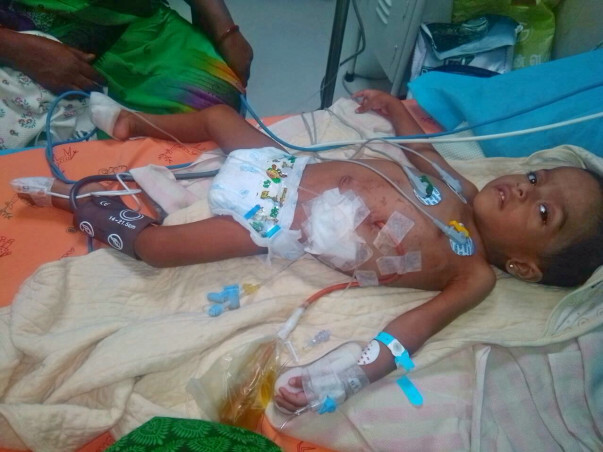 Baby Gnana had his third surgery when he was 9 months old. He is constantly bleeding in his mouth. 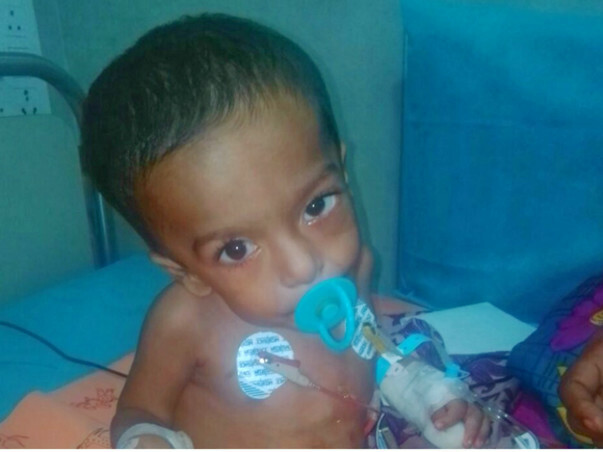 Esophageal replacement surgery is the only solution to save him from this dreadful disease. Sukanya and Prakash have hardly slept or ate in these days. 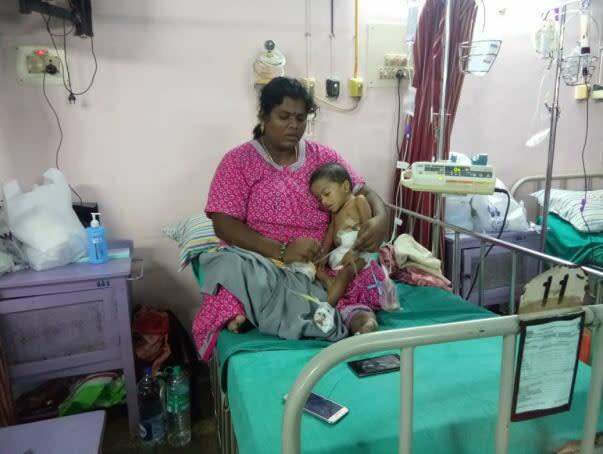 Sukanya has fainted a couple of times, not able to bear the pain his son is going through. She cries all the time and desperate to save her only son. Having run back and forth to hospitals and his son's multiple surgeries have taken a toll on her physical and mental health as well. Prakash was working in a private company for a meager income but now he has quit his job to take care of his son. Prakash has to take care of his elderly parents as well and they have no one else to support. He is willing to do anything to save his son. "I have lost everything, I sold everything I had but I do not regret for anything. All I need is my son. I can earn money anytime but I can never bear his loss. I wish to see him live a life without pain, I wish him to smile and to be happy. I should save him at any cost." - Prakash. Prakash and Sukanya have sold all the jewels they had and exhausted their savings. They are desperate to save their baby. You can see Gnana's pain and suffering, and hear it in his screams. They managed to gather all their strength and do all that is possible to help him come out of this pain. 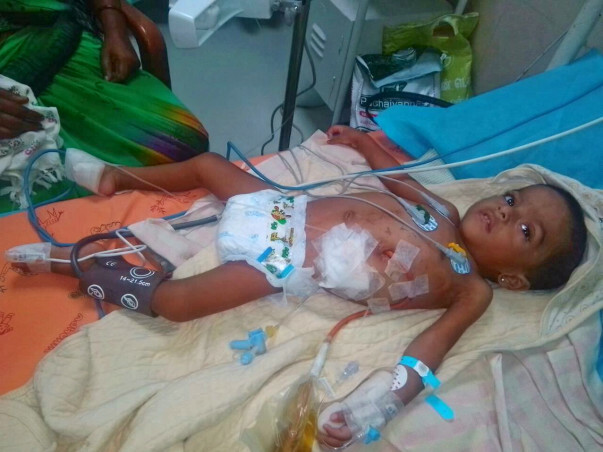 His bleeding cannot be stopped without the surgery which they cannot afford. Prakash has no source of income. He is struggling to save his son. He has already spent nearly 5 lakhs and has borrowed money from his friends. 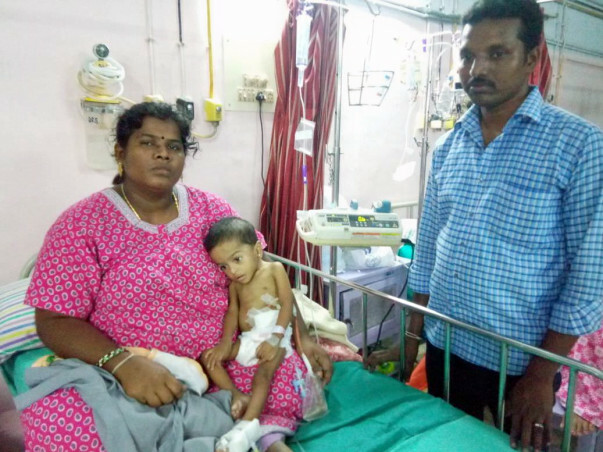 He needs Rs 2.5 lakh more for the surgery. 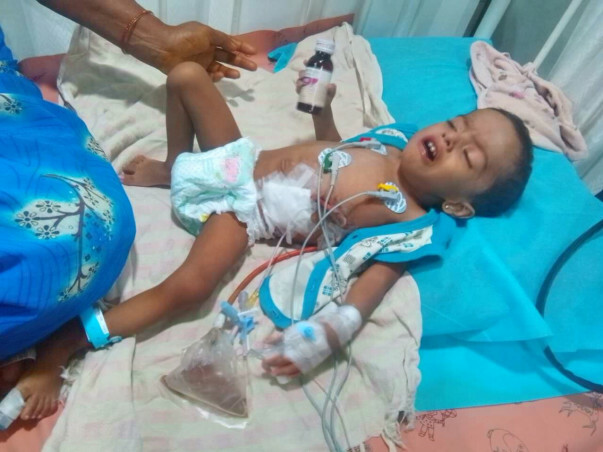 Your contribution can save Baby Gnana from this endless misery. Still baby Gnanasoundharyan under treatment in CMC hospital Vellore from Febraury 2018. 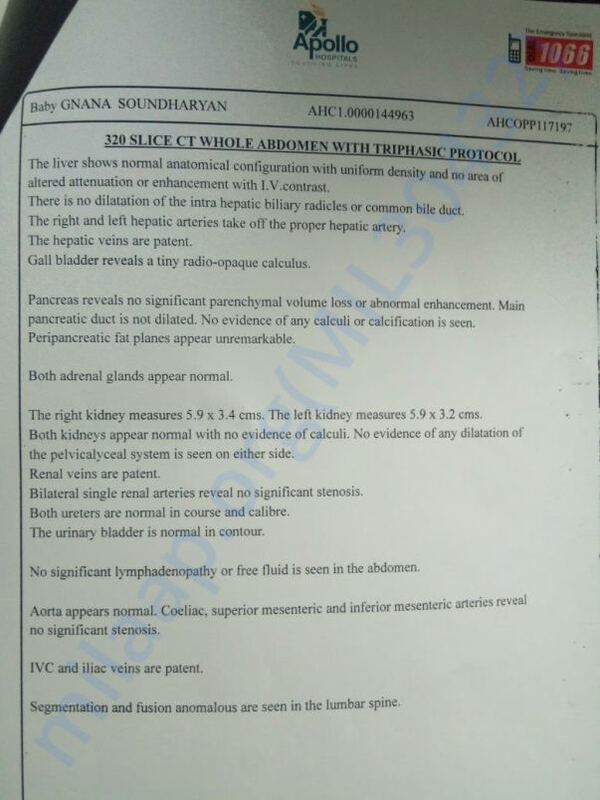 Now the baby health which is Portal hypertension in the blood remains the same. He is closely monitored by the hospital. Will keep you posted. Thank you for the love and support.